There are two things one can count on in the modern movie landscape: Disney will (almost) always make a lot of money and people love big-budget horror. Those two truths will be proven this weekend at the box office as Tim Burton's live-action Dumbo squares off against Jordan Peele's Us. With little doubt, Dumbo should come out on top but Us should prove to have a very strong second frame, cementing Peele as one of the most bankable men in the genre. Dumbo sees Tim Burton back with Disney after having kicked off their run of live-action remakes with his version of Alice in Wonderland back in 2010, which grossed more than $1 billion at the global box office. Disney is hoping to repeat that success, at least to some degree, with a stellar cast that includes Eva Green, Michael Keaton, Danny DeVito and Colin Farrell, not to mention a very adorable, big-eared elephant. 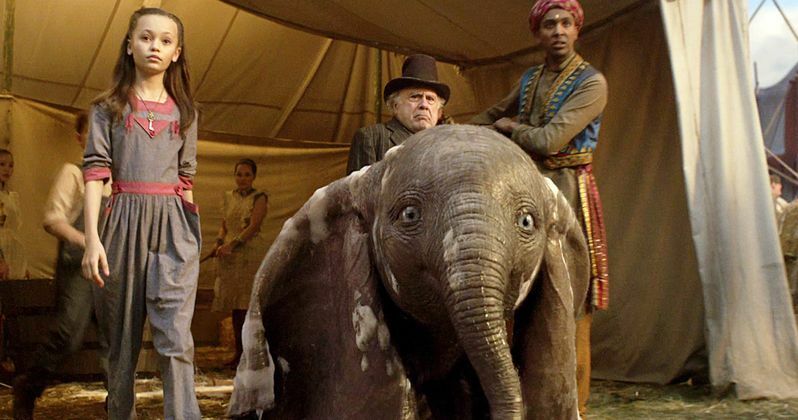 Projections have Dumbo taking in anywhere between $40 and $58 million on its opening weekend. That's a pretty big gap between the low and the high end. So far critics have been somewhat divided, as the movie currently holds a 52 percent approval rating on Rotten Tomatoes. Even on the low end of those projections, Dumbo should manage to come out on top, barring a pretty big surprise. Though, we can't totally rule that out. Us opened last weekend to a record-breaking $71.1 million. That blew away projections and proved that Jordan Peele is a voice in the horror genre that people are ready and eager to listen to. Certain moviegoers haven't responded quite as positively to his latest effort as the critical community has, and that could dampen word of mouth heading into its second weekend. Then again, many who did like it are eager for a second viewing. If Dumbo stumbles and Us overperforms again, we could, and I stress could, have a major upset. Captain Marvel should take the number three spot with around $20 million and it could pass the $1 billion mark globally, which would be huge. Five Feet Apart and Wonder Park look to round out the top five. Elsewhere, Unplanned, which tells a real-life tale about a Planned Parenthood employee, should bring in around $3 million, while Matthew McConaughey's The Beach Bum arrives from Neon, with hopes to make it into the top ten while debuting on 750 screens. Be sure to check out our full list of weekend box office predictions below and check back with us on Sunday for a full list of estimates. These numbers come to us from Box Office Mojo.